Calling All Lightworkers to Unite! Throughout the past few months, many of you have been asking us how we see and what messages we receive from the Higher Realms concerning the worsening refugee crisis and what could be behind it. We have answers but for obvious reasons we do not want to share them here on Facebook. Our world is drifting towards another serious crisis. If one can truly see into the incredibly destructive forces working in the background they may be overcome by despair about whether it is still possible to save this planet at all and to realize the life we have been born for. Yet we do have an answer to this situation! We have planted it into the spiritual message and each word of our latest meditation double CD. We would like to share this invaluable treasure now with all the open-hearted and prepared Lightworkers ready to join together in this work. Through working together, we can turn around the current fate of Planet Earth so that it may return to the life-channel of the fate alternative of the Ascension. This can only be realized together, so please feel free to share the news and invite as many Lightworkers to join in as possible, like we did during the Global Correction of Fate in 2007! This is an extremely powerful and monumental collective meditation for any Lightworker who feels the calling to join a new wave to create the rescue of Planet Earth and to understand and anchor the process of the Ascension. We have received an amazingly powerful 8th dimensional instrument from the Melchizedek Soul and from the masters of Sirius. The journey guides us through three very important steps. In the first two, we create special protective energy fields. The creation of the Mer-Akai Protective Shield can help us cleanse our life spheres and place the entire planet Earth under protection, while we can also experience a very deep energetic healing and retuning. These shields are capable of detecting and deactivating the invisible mind-manipulating and destructive energetic programs from our personal spheres. Unfortunately negative influences permeate our present world in every moment. We need to realize this and “name it” by our recognition. These negative influences are caused by the dark and devastating means of electromagnetic warfare, such as HAARP, the Gwen towers, the X-band radars, Chemtrails etc. To satisfy the self-purposed geopolitical games of the power elite these negative influences are continuously destroying our planet and are destroying the possibility of healthy and harmonic earthly life. The creation of the Mer-Akai Protective Shield in the first two steps of the meditation counter these negative influences in several ways. In the third step, we ascend towards a heavenly rapture, by bringing the most wonderful mysteries of Christ to life. We create a new Ascension Bridge from the united heart-power of co-joined Lightworkers. Through this and together we ascend Gaia’s third dimensional world into the light-reality of the fifth dimension to create the energetic imprint for a new and sanctified life on this planet, one that bears the resonance of Light. If you have recognized your mission as a Lightworker already and you would like to connect to this worldwide movement as a creator of the planetary dimensional shift, we welcome you into our circle with sisterly love to meet through the ethers in this sacred and uplifting ministry! In this very complex inner pathway Part I (43:17 min.) and II (36:21 min.) belong to each other and should be used one after another, so it is a very long meditation which requires good spiritual openness and endurance, and you need to take time for it. But you can work with this in a way that you listen to and experience Part I on a more frequent basis to form a perfect protective shield around yourself and your loved ones and also to receive a great energetic healing. Then maybe once or twice a week you can go through the two parts together so you can be a part of the alliance of Lightworkers creating the radiating new Ascension bridge and a hopeful future for our planet. This is an extraordinary and cathartic experience for sure! You can purchase and download this powerful MP3 meditation here on our website, through our webshop. In this very complex inner pathway Part I (43:17 min.) and II (36:21 min.) belong to each other and should be used after one another, so it is a very long meditation which needs quite a good spiritual openness and endurance, and you need to take time for it. But still you can work with this in a way that you experience Part I on a daily basis there by forming a perfect protective shield around yourself and your loved ones and also receiving a great energetic healing. Then maybe once or twice a week you can go through the two parts together so you can be a part of the alliance of Lightworkers creating the radiating new Ascension bridge and a hopeful future for our planet. This will be an extraordinary and cathartic experience for sure! We note that the forming of the Mer-Akai shield assumes some knowledge about the basis of the sacral geometry, but we give a bit of help with this by the images which you can find on our website next to the CD. In addition, we recommend that beside working with it alone at home, this meditation is to be experienced together in groups so that we can multiply its power. Its critical mass is reached in the joining of at least four human hearts. So if there are four of you together then your forces will exponentially increase. Moreover, if four people experience this grandiose Ascension meditation at different points of the world but all at the same time, the group-principle comes into effect too. And, the Celestials have informed us that if we can reach the number of 9000 participants who will work for the Earth in different rhythm but all with their consciousness being awakened to this wisdom of the creation of the Mer-Akai Shield and the Ascension Bridge; then our power will be unstoppable and so our atmosphere and personal energy fields can be maintained in a constantly cleansed state. 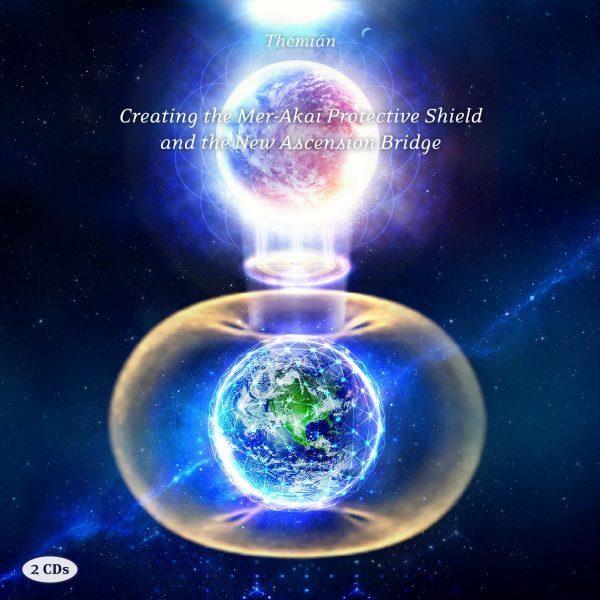 To reach critical mass, we can also multiply the power of the New Ascension Bridge if many of us experience this wonderful ritual at the same time. Thus we recommend that everyone offer an hour of their life every Saturday at any time which is appropriate for this joining of Lightworkers! Since our group has been connecting soul-to-soul on the weekends for many years now, you can be sure that there will be at least 150 people working with you simultaneously at this time. Moreover, we would like to share the good news, that on the first Saturday we sent out this calling, there were 350-400 people meditating already together along with this CD! And this number will increase as you join too, so together we may become the creators of this fate-changing spiritual network of light! In this way the community of Lightworkers can take back control over the future and fate of our beautiful planet without battles and weapons but by our pure spiritual power and clear intention. So let’s create this rescue mission together by forming our individual and collective Mer-Akai Shields and by forming and maintaining the New Ascension Bridge! We wish you all happy and blessed experiences filled with Light! P.s. We would be really glad if you sent an e-mail to us (orders@stellarnations.com) when you plan to work with this meditation s path in a group once or regularly so we can know how and at which spots of the globe we work together with our Light-sisters and brothers. We would also like to note to you that we have prepared a longer article on the details of the conscious structure and inner codes of this meditation, about the symptoms and questions that may possibly arise during the meditation, and also about the preparation for the uniting of the Lightworkers. Please find this article here!